Just a little peek at our Easter celebrations this year. Last Easter we kept our celebrations pretty low key because Espen was only two months old and slept for most of the day, so this year we got into things a bit more. Espen's grandparents came up from southern Utah for the weekend, which Espen very much enjoyed. It was really great to see how much fun they had together. We had wanted to go and see the Carl Bloch exhibit at BYU while they were here, but apparently the rest of the valley also thought that would be a great way to spend the Easter weekend, because they were out of tickets. I'd love to sneak in a visit before we leave for Norway, though. We had roast lamb for dinner on Easter Sunday, and as usual I enjoyed setting the table. 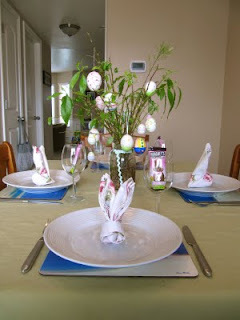 I tried to keep things fairly simple, and just used the painted eggs as a center piece. 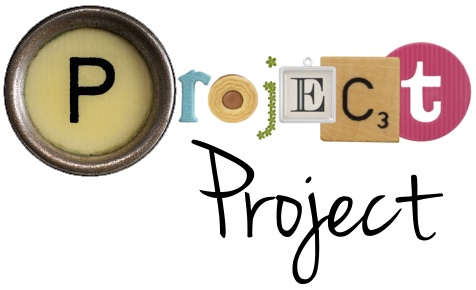 Did any of you try making those? I'd love to see your results if you did! We didn't do Easter baskets this year, but I did make sure that everyone got a little chocolate bunny. Next year I will make sure to buy the pretty Lindt ones earlier. We made most of our Easter preparations on Saturday (I know, I know...) and the shelves at Target (and Walmart and Macey's) were just wiped for candy. I found a tutorial for these bunny napkins, which Nick very graciously helped me make. He liked to do origami as a kid, and I liked to do things that required zero patience and very little attention span. Marriage is a beautiful thing. The highlight of our Easter was Espen's Easter egg hunt. We filled six eggs with things like Annie's Bunny Grahams, fruit leather and a few Legos. And M&M's, which were a huge hit with Espen. Then we placed them around the living room in fairly obvious locations so he could find them. Let me promise you that it did not take long for him to figure out what the aim of the game was! At first he was just delighted to have six new shiny toys to play with (which he calls "balls" or "apples"), but then when we showed him that there were toys inside, life could not get much better. 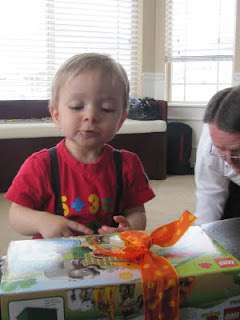 Until, of course, we presented him with a new box of Legos. It was a lovely, relaxing weekend with family, and we had so much fun showing Espen a few traditions. As he gets a little bit older, we hope to teach him a bit more about the religious nature of Easter, but until then, it's lovely to just spend time together. 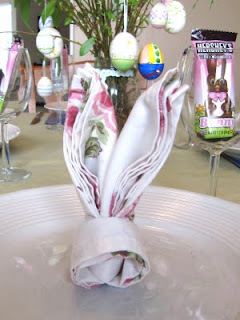 Those bunny napkins are stinking adorable!